Petrodex combines the real beefhide chews that dogs love, with a dual enzyme formula to kill the bacteria that cause plaque and tartar. Petrodex Dental Chews and Strips has different options and/or variations, please choose below. 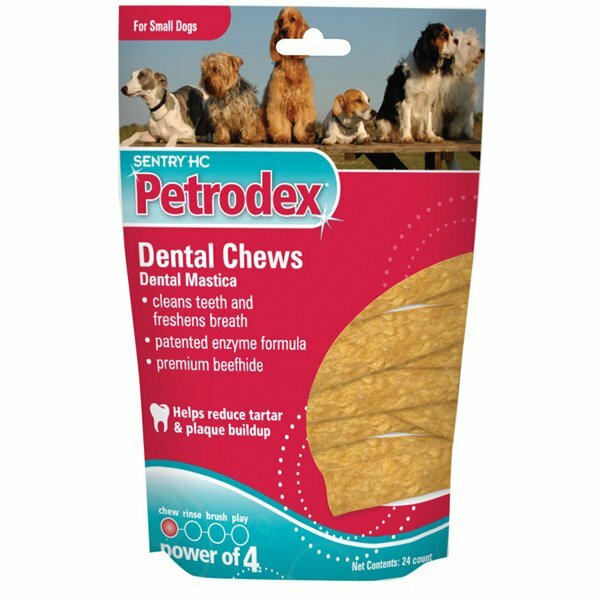 Petrodex combines the real beefhide chews that dogs love, with a dual enzyme formula to kill the bacteria that cause plaque and tartar. The chews are coated with this formula, which is activated by saliva as your dog chews. Additionally, the abrasive texture of the hide and the persistent chewing action help to sweep away debris and loosen tartar build-up. For best results, offer your dog one chew per day, along with regular tooth brushing and veterinary dental care. Assorted sizes. Premium beefhide chews for small and toy dogs with dental polishing agents. Great way to help support pet s oral health. Designed to work with dog s natural chewing action to help prevent plaque and help control tartar.